Chrysanthemum is a happy little mouse who is so excited to finally start school. But from the very first day, some of the other students begin teasing Chrysanthemum for her long and flowery name. She used to love her name, but not any more. Her parents try to comfort her, but each new day brings more criticisms and more sadness for Chrysanthemum. Then one day, the school's popular music teacher tells the class that her first name is long too--Delphinium--and even announces that she is going to name her soon- to-arrive baby the prettiest name she's ever heard-- Chrysanthemum! Wow! Chrysanthemum is thrilled, and the rest of the students--even the ones had been critical before--suddenly want long and pretty names too, just like Chrysanthemum. We love this adorable story and its sweet message of loving yourself and cherishing what makes you different and special. The story also does an excellent job of showing how much unkind words can hurt the recipient. 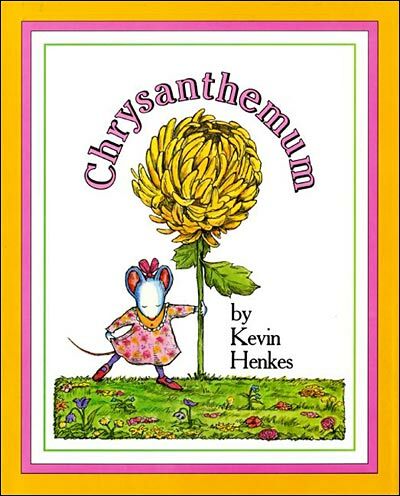 Henkes starts the book with a happy and self-assured Chrysanthemum, but half way through the book, the repeated criticisms from the other students have left Chrysanthemum sad and defeated. She has clearly lost her spark, and your students will not only feel for the little mouse, they'll also see the harmful effects that even just a few critical or uncaring words can in have. This book was selected as an ALA Notable Children's Book and a Horn Book Fanfare Children's Book Award winner. Teachers:This is a great book to read during the first week of school, whenever you are experiencing bullying behaviors in your classroom, or even during a unit on emotions, as "the range of expression and emotion" that Henkes imbues in each character is "absolutely perfect." (School Library Journal) This is one of our favorite all time books--one we think belongs in every early grades classroom! And here are some more pages. The one in the middle talks about how Chrysanthemum loves to see her name written on envelopes, birthday cakes...even when written in her own writing. She "thought her name was absolutely perfect. And then she started school." That's when the teasing began and she began to question the name she had loved for so long.